What is the value of education for household income? The Census Bureau's annual survey data for 2015 published last week gives us some interesting insights into this question. The median income for all households with a householder age 25 and older was $58,044. The chart below shows the median annual household income for nine cohorts by educational attainment. We've rounded the data points to the nearest $100, e.g. $58.0K for all households age 25 and older. 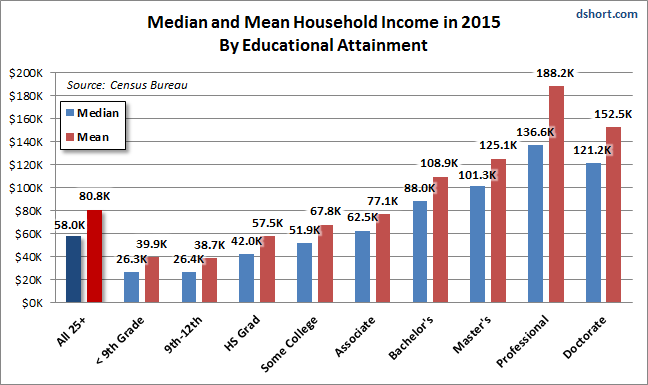 A particularly notable feature in the chart above is that the Bachelor's Degree median at $88.0K is over double the High School grad's $42.0K. A Master's Degree increases the Bachelor's median by $13.3K. A Professional Degree (Law and Medical being the major ones) adds another $35.3K. Here is the same chart, this time illustrating the Mean (average) household incomes for the same cohorts. For a better sense of the mean skew, here is a side-by side comparison of the median and mean. As we would expect, the mean is larger than the median for all cohorts. 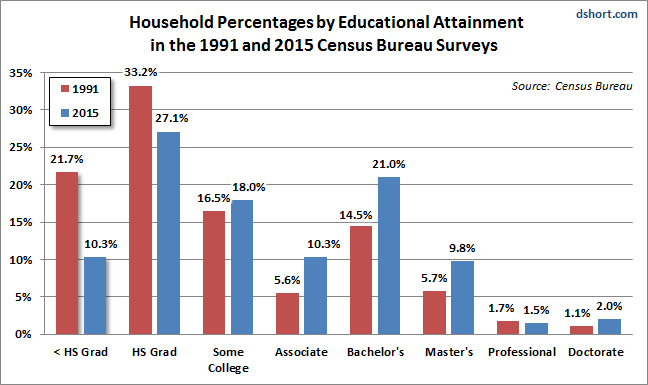 The educational attainment of householders has clearly increased over the time frame of the Census Bureau's annual data. The current survey questionnaire dates from 1991. Here is a pair of pie charts that highlight the difference in the cohort percentages in 1991 versus the present. Here is the same visualization of the year-over-year comparison. The column chart below gives us a clearer comparison of the individual cohorts. 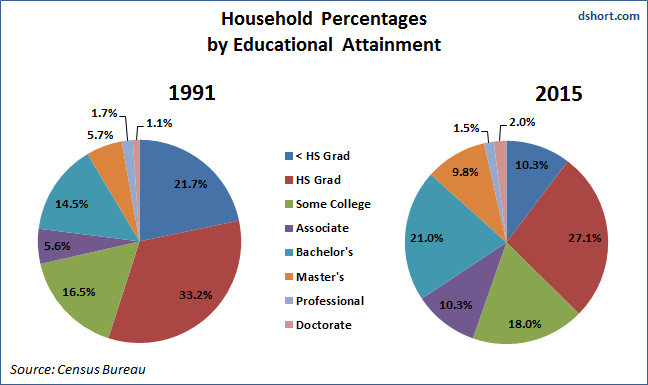 For example, we see that nearly 22% of householders had less than a High School degree in 1991. That number has been cut by more than half. 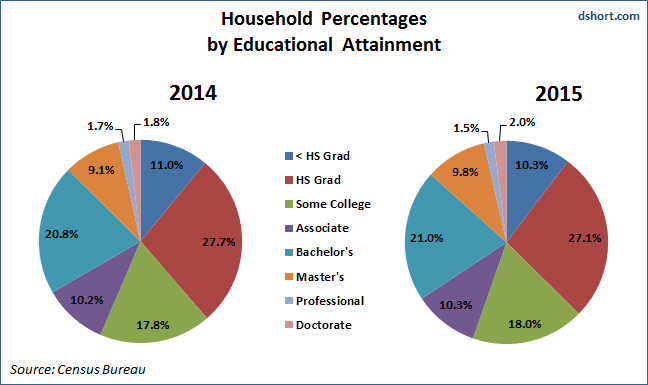 Associate Degree holders are up 85%, Bachelor's up 45%, and Master's up 71%. Educational attainment has clearly advanced over the 24-year time frame of this Census Bureau series, and the income benefits are obvious. Of course, the cost of post-High School education is substantial. 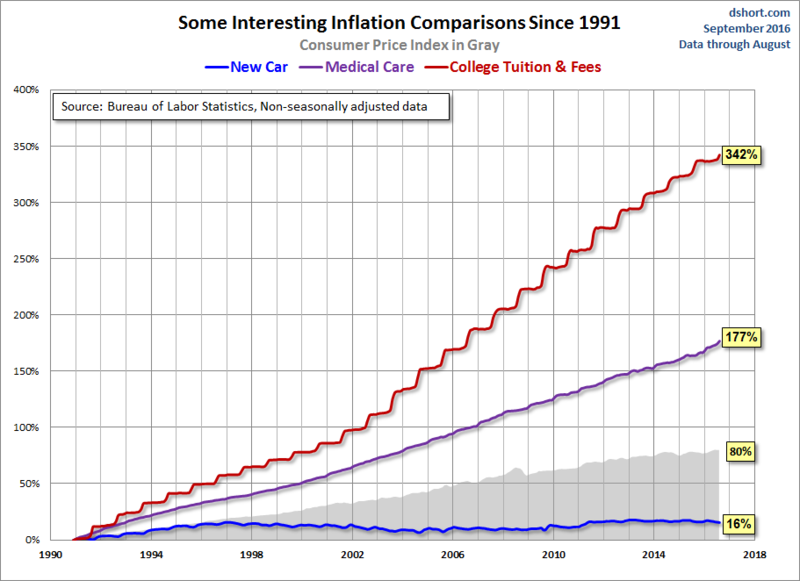 Here is a snapshot of inflation comparisons since 1991. 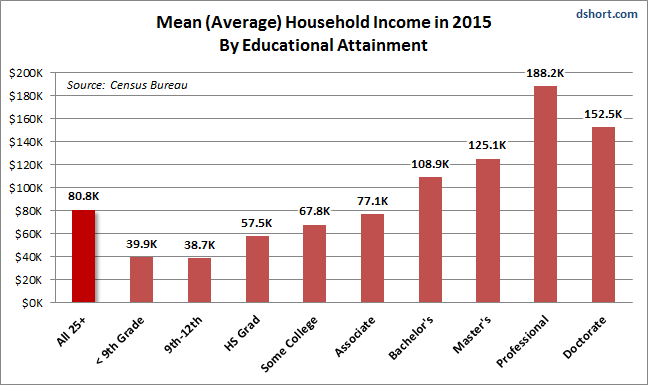 Advanced educational attainment correlates with higher household incomes. But the cost of that education has soared.